Automatically and continuously measure photosynthesis, and related parameters, in 1 to 4 leaves or plant species simultaneously. 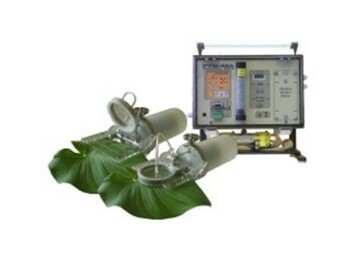 The PTM-48A is the only instrument available for the continuous monitoring of photosynthesis. 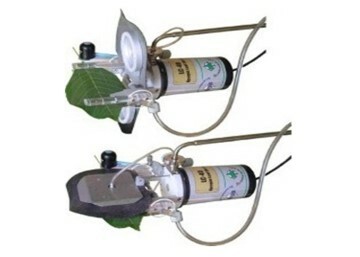 Numerous other plant and environmental parameters, such as meteorological parameters, sap flow, dendrometers and soil moisture, can be combined and integrated with photosynthesis measurements made by the PTM-48A Photosynthesis Monitor. The PTM-48A Monitor is truly state-of-the-art system for long-term automatic recording physiological characteristics of intact plants. The Monitor has four inputs for original automatic self-clamping leaf chambers. The chamber is normally open and shuts the leaf only for 30 seconds to take readings of both CO2 and H2O exchange rates. The short measurement time provides minimal disturbance of natural leaf conditions. The standard LC-4B Leaf Chamber has a 20 cm2 aperture suitable for a wide variety of broad-leaf plants. Any LC-4B leaf chamber may be equipped with the optional leaf temperature sensor that enables additional recording of stomatal conductance for that particular leaf chamber. A new optional LC-4D Opaque Leaf Chamber allows partitioning of the leaf CO2 exchange that is based on PIB (post-illuminance burst) technique. Paired LC-4B and LC-4D leaf chambers provides evaluation of photorespiration, dark respiration, gross and net photosynthesis. The monitor has also 8 analog inputs for optional sensors and one digital input for RTH-48. The Monitor provides fully automatic continuous operation with sampling rate selectable from 5 to 120 minutes. 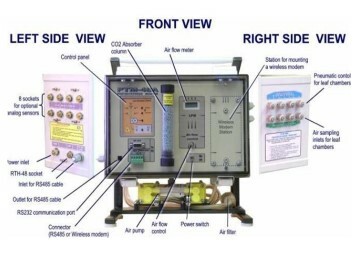 The Monitor is a portable 12 VDC instrument. The RS-232 and RS-485 ports may be used for communicating with the PC. Either 2.4 GHz Radio or GPRS modem may be used for remote operation. The Terminal Emulator software allows controlling system setup and operation as well as data downloading and export in TXT or CSV format for further processing and analysis. A simple graphics viewer is also available. Turgeman et al 2011. Mycorrhizal association between the desert truffle Terfezia boudieri and Helianthemum sessiliflorum alters plant physiology and fitness to arid conditions. Mycorrhiza, 21, 623-630. Balaur et al 2009. Novel technique for component monitoring of CO2 exchange in plants. Russian Journal of Plant Physiology, 56, 423-427. Balaur et al 2013. Specific features of photorespiration in photosynthetically active organs of C3 plants. Russian Journal of Plant Physiology, 60, 184-192. Zhang et al 2014. Modeling and prediction of CO2 exchange response to environment for small sample size in cucumber. Computers and Electronics in Agriculture, 108, 39-45. Schmidt et al 2008. Evaluation of Combined Application of Fog System and CO2 Enrichment in Greenhouses by Using Phytomonitoring Data. Acta Horticulturae, 801, 1301-1308. 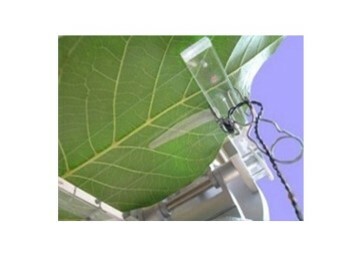 Built-in RTH-48 Meter for measuring Photosynthetic Radiation, Air Temperature, Relative Humidity and Leaf Wetness. Has input for the digital SMTE Soil Moisture, Temperature and EC sensor. Power requirements: 12 VDC @ 60 W max. Interface: RS232 and RS485. Optional RF or GPRS modems. Terminal Emulator and Graphics software for Windows.